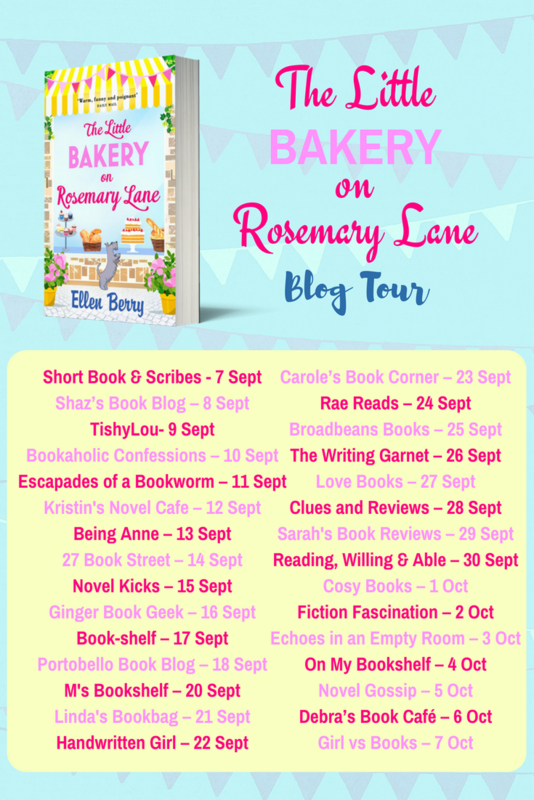 Welcome to my stop on the Blog Tour for The Little Bakery on Rosemary Lane by Ellen Berry! This fab book is out now with Avon Books! This book has everything you could want - food, family, friends and feuds, and is the perfect read for fans of Trisha Ashley, Katie Fforde and Carole Matthews. I can't quite decide whether a clafoutis is a pudding or a cake. It is very French, which is pleasing - and virtually bungle-proof which is good news if, like me, you find actual cakes quite a challenge to make. Really, it’s just a batter with tons of fruit - and it’s lovely served warm with ice cream. An impressive pud for when you have friends over, with minimal effort required. When my kids were little we lived in a small country town called Biggar, in North Lanarkshire, Scotland. A favourite walk was to Bizzyberry Hill, which was a haven for raspberry picking. You can easily substitute the cherries in this recipe for raspberries - or ripe and juicy peaches, plums or apricots, if the fancy takes you. 1. Mix together the cherries, sugar and liqueur (if using) and set aside for 2 hours to bring out the sweetness of the fruit. 2. Preheat oven to 180C/Gas 4. Grease a baking dish with butter, sprinkle with caster sugar and shake out any excess, so a fine coating is left. 3. For the clafoutis batter, gently melt the butter, taking care not to let it burn. Remove from heat and set aside. 4. Whisk together the eggs, sugar and vanilla in a large bowl until creamy. 5. Add the flour, whisk until smooth, then gradually add the milk, cream, salt and melted butter. 6. Add the fruit to the batter and pour into the buttered, sugared baking dish. 7. Bake for 30-35 minutes, or until the top is slightly golden and the blade of a knife inserted in the middle comes out clean. 8. Sprinkle with caster sugar and serve warm with cream, ice cream or just by itself, sliced with coffee or tea. I can't wait to read this book! 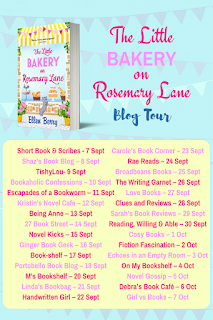 It sounds delicious and I really enjoyed my first visit to Rosemary Lane! Huge thanks to Sabah Khan at Avon books for allowing me to be part of this tour and for sending me a gorgeous copy of the book! Review to follow.